Alex Sebastian, an escaped Nazi who flees to South America poses as a wealthy Rio de Janeiro socialite alongside his fellow Third Reich fugitives. But little do people know that they are plotting revenge against the Allies by building their very own atomic bomb. The only question is where to store the weapons grade uranium needed to detonate the bomb? Director Alfred Hitchcock’s 1946 motion picture Notorious starring Cary Grant and Ingrid Bergman as American spies determined to uncover this explosive secret hidden inside a bottle of ’34 Pommard proves to be the perfect blend of wine and film. As part of their undercover operation, Bergman’s character Alicia marries Alex and successfully steals the key to his wine cellar so she and Grant can go investigate while a lavish party takes place upstairs. Searching for clues, Grant’s character Devlin discovers a sheet of paper located behind several vintages standing upright – an unusual position for any bottle in a wine cellar. But while taking a closer look, a 1934 Pommard moves closer and closer off the shelf. Delicate as the grapes that created this fine Pinot Noir, one careless mistake causes the bottle to come crashing down. Yet on impact, black sand is seen amongst the broken glass, raising the eyebrows of both Devlin and Alicia. For Hitchcock to use a bottle of wine as the “MacGuffin” – a desired object that the protagonist pursues in a movie – is not surprising. A passionate oenophile, the Master of Suspense was renown for giving those who visited his Bel-Air mansion a detailed tour of the custom built wine cellar he had installed. And having purchased a vineyard in the Santa Cruz Mountains probably explains why many of his movies including The Birds were filmed in Northern California. But his choice of 1934 Pommard as the bottle to store the uranium ore in reflects Hitch’s passion for French wines, and more specifically, the region of Burgundy. 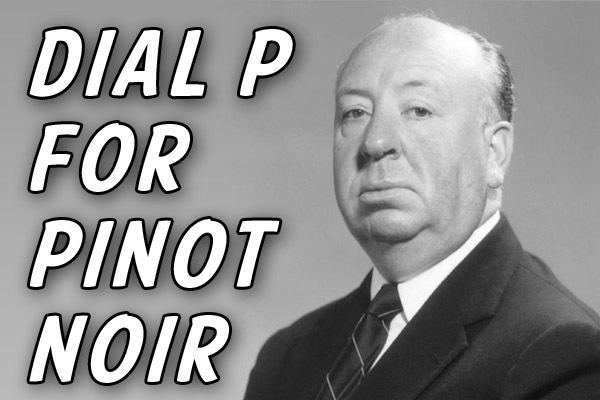 Alfred Hitchcock was a wonderful fine wine aficionado. Remember Grace Kelly bringing a bottle of Le Montrachet and a meal from the 21 Club to the apartment of a wheelchair bound Jimmy Stewart in the Hitchcock directed 1954 movie Rear Window? Much later the film was color restored and this magnificent white Burgundy magically was turned erroneously into a light red Burgundy. Bad mistake that Hitchcock would have been outraged about due to this lack of attention to accurate detail!